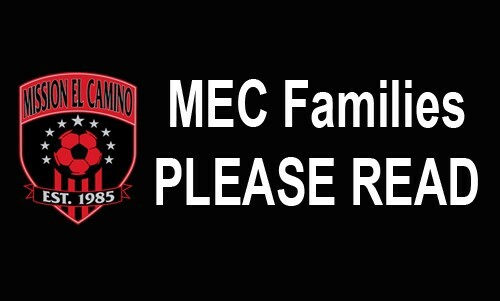 Updated Friday January 10, 2014 by Mission El Camino Soccer Club. Pay complete attention to your coaches. Observe the Zero Tolerance Rules. No one, except the players, is to speak to the referee during or after the game. Absolutely no disputing calls, during or after the game, no remarks to the referee to watch certain players or attend to rough play. NO YELLING at the referee, EVER, and no criticism, sarcasm, harassment, intimidation, or feedback of any kind during or after the game. Do not coach players from the sidelines. Do not shout at any players (particularly your child). Leave the coaching to the coaches. Give adequate notice for all absences form training and games. Be honest in all dealings with coaching staff. Help with field set up, team equipment and team support. Note: Parents wishing to speak to a coach about any issue relating to their child should e-mail their coach requesting to speak to them at practice. Please refrain from addressing a coach at the day of a game. Thank you, and have a GREAT season!